If you were a kid in the 80s, you remember "Today's Special". It ran on TVOntario from 1982 to 1987 and starred Jeff, Jodie, Sam and Muffy, that mouse who spoke in the most annoying rhymes. Sam was the store's security guard and his trusty computer was TXL Series 4, who seemed to watch over the store for Sam. Sam was a hard worker, as I recall, but he wasn't perfect. 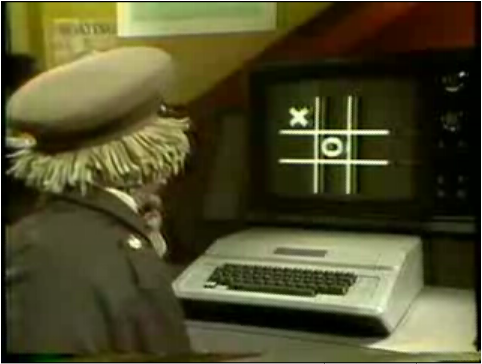 Here is Sam Crenshaw using company time and resources to play a frivolous game of tic-tac-toe. Busted!!! Wow a Apple ][+. The good old days of the 6502. I wonder if it has the 16k "Language card" giving it a grand total of a wopping 64k (with 48k on the Main Board). But I don't see the 5.25 Floopy Drive. Sam seems to be working hard here.